Teach Seismology without Measuring Earthquakes. 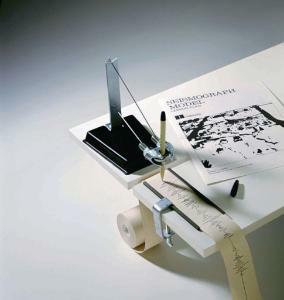 The new, improved design of this “seismograph” is actually a pen attached to a weight suspended from a support. Vibrate the table on which the model is mounted; the support moves with vibrations of the table, but the pen remains stationary. Vibrations are recorded on a roll of paper as it is pulled through the frame. Use one model for classroom demonstrations, or several for comparison exercises.